Nine great adaptations and one original. You'll hear What Am I here For? and Come Sunday in Salsa. It Don't Mean A Thing If It Ain't Got That Tumbao! and Satin Doll in Merengue. Two very sensitive and beautiful Boleros are In A Sentimental Mood and Solitude. And if you like Cha-Cha, try Don't Get Around Much Anymore, I Let A Song Go Out Of My Heart and the great original El Duke. To close the recording Bobby has put Caravanback in it's African roots of the 6/8 rhythm. Critics' Choices, L. A. 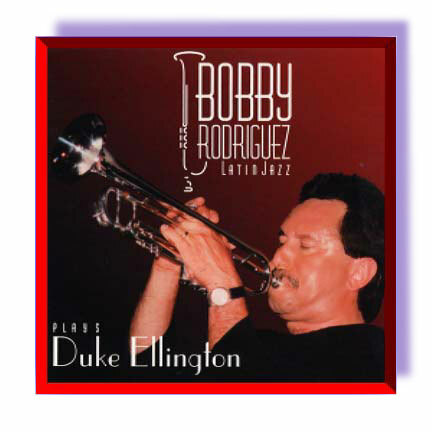 Reader - Bobby Rodriguez is a crisp trumpeter, whose quicksilver ease in jumping to the upper register not only places him in line with the great Latin lineage on the horn, but marks him as a descendent of Dizzy and Lee Morgan as well. Riviera Hotel-Las Vegas, Nevada - Bobby is a LatinJazz sensation! ! !